I would say that I don’t mention my affection for Final Fantasy XI often enough, but the fact is that I mention it a lot. Sure, it’s also a game with a lot of frustrating issues, but it’s also something near and dear to my heart. And as Final Fantasy XIV looks at the wreckage of another attempt at allowing some customization of jobs and players ask if we could just port over FFXI’s subjob system, it is with a lot of love and familiarity that I say this is a terrible idea, absolutely bad, do not attempt. I understand the sentiment, of course. The subjob system allows for you to get the benefits of another job and thus makes the addition of each new job almost a fractal of customization; one new job multiplies existing job numbers substantially. But it wouldn’t work well with this particular game, for several reasons… including the fact that the subjob system itself wasn’t actually as good as people remember. Why? Well, let’s start with something very simple and straightforward. FFXI jobs were designed for a subjob system; FFXIV ones are not, and indeed cannot be. You can see this in something as simple as a job ability chart. At the lower levels, most every job learned a lot of things of general use and broad application, tricks that other jobs could conceivably derive notable benefits from accessing. For the longest time, the level cap was 75, and that meant more “specialized” tricks started showing up around level 40 for any given job. It’s not an accident that Black Mage learns Warp II at 40, for example. The ability to transport your party members back is a specific piece of assistance that’s meant for Black Mages, a utility other jobs don’t get access to. Cure IV is placed highly enough that, say, a Black Mage is just not going to have the raw cure potency to make up for lack of MP to serve as a healer past a certain point. And so on. Obviously, the rise in level cap broke this a bit, but there’s still a design thrust overall. Your abilities as a job past level 50 are unique to that job, but the ones before that are more universal. Your earliest skills are of the broadest application. This is not the case in FFXIV. Your rotation and abilities are based upon a slow accumulation, and your earliest abilities are not the most widely useful ones but the most foundational ones. They’re abilities your later development is based upon. But don’t trust me on it; let’s look at what would happen if the next expansion just ported over subjobs with a random job, in this case Ninja. Looking at this in terms of what is actually useful, though? Well, Fuma Shuriken and Mug can be woven in off the GCD on rather long cooldowns, that’s a little extra damage. Same with the assassination, at that. The silence is something for the few things that can be silenced. A little bit of extra physical damage. But most of this stuff is tricks other jobs who want it already have; I can’t imagine Dark Knights wanting Shukuchi over Plunge, for example. Realistically, then, you’re looking at “a few extra bits of damage very intermittently.” Because, again, these abilities aren’t meant to be broadly useful. Most jobs who deal physical damage have gotten their basic damage combo around that time. It’s normal. It’s not a failing of design; it’s a design that prioritizes a slow build of abilities and complexity. And this also underscores another issue because Ninja’s damage is physical and mostly melee-range. You wouldn’t want to use it on Bard, in all likelihood. This is a good place to remember that FFXI did not actually live up to the promise of that subjob system in most ways. Yes, theoretically your Blue Mage could sub 21 different jobs. That’s a lot! But in practical terms, most of those subjobs are terrible for Blue Mage. Several of them are terrible for everyone; there’s a reason you don’t see Bard or Beastmaster as a subjob basically ever. In fact, for most jobs, you have four or five subjob options, plus one or two more with rare situational use. And some jobs are just more universally useful as subjobs (Samurai, Black Mage, White Mage, Warrior, and Dancer all spring to mind). Nor was this really any more “customized” than anything in FFXIV right now. If you played NIN/WAR, for example, you played identically to every other NIN/WAR… until you started investing Merit Points at level 75. And since pretty much everyone was using NIN/WAR, you were probably playing exactly the same job as others plus or minus gear drops. 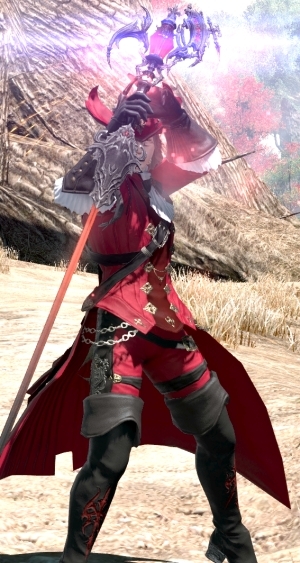 It also violates one of the core tenets that Naoki Yoshida has put forth for the game, that a player should be able to level Dragoon alone from start to finish. If you really just want to play your character as a Dragoon and never level any other job, that should be doable. You can argue over whether or not this is a good idea (I’d say it’s a mixed bag), but it is still there. “But what if your subjob is more about the essence of the job instead of just the list of abilities?” Then it’s not FFXI’s system any longer, is it? It’s similar to the subjob system, but it isn’t the same thing. We actually know what FFXI systems look like. Calling something conceptually similar but mechanically different “using FFXI’s systems” is disingenuous. More to the point, it means that you’re creating a situation wherein you know what you mean, but no one else does. What is the “essence” of Ninja? Is applying Vulnerability Up part of it? Is Ninjutsu part of it? What about movement speed? Multiple attacks in quick sequence? All of these things are part of Ninja, but which one is the essence of the job? You might have an answer upon a moment’s thought, but it’s not something easy to point to. And that’s fine! But it means more than simply “let’s port this old system here” is required before it works properly. I understand why people would want the subjob system, of course. As it stands right now, leveling two jobs is a matter of watching both jobs have basically no overlap whatsoever; your only real advantage is whatever gil and play experience you’ve picked up elsewhere. Really, whatever system we get in the next expansion should do something to reward players who have, in fact, leveled multiple jobs. And the subjob system does that by rewarding you with more options for more things leveled. It just doesn’t actually work within FFXIV or even fix the problems of identical play. What we need to fill the space that role actions failed to fill is something altogether different. Feedback is welcome down below or via email to eliot@massivelyop.com. Next week, we’ll have patch notes, whee! I love doing patch note columns. Subjobs or really any sort of customization don’t seem to be possible with the way the system has been set up to be so clear-cut and essentially a matter of how good you are with using the abilities you have and using them at optimal moments. The subjob system of FFXI was undercooked and lazily integrated. Could FFXIV make subjobs work? Yes, they could, they have money and talented developers. Did they even bother to properly integrate cross-class skills? No, they didn’t even bother to do that. In the light of this I surely don’t understand the discussion. At end end of the day all classes play almost identical also. If a Mnk was able to take a Drg subjob it would be nothing different since the classes play almost identically. If they ever mixed up classes to not all be cookie cutter copies of each other then subjobs might work. The whole game is just painted into a corner with all these themed jobs … Yeah they sound cool in the expansion trailer, but you have zero uniqueness to anything and everyone is just the exact same character because you don’t even have viable alternative gear loads. It is just like the housing system where every size of building has got one floorplan and there is just no real options to personalize anything. You guys nailed it. I never could wrap my head around the fact I can’t like the game and feel ‘meh’ there. Here it is. I’ve not played FF11 but it indeed sounds like the subjob system wouldn’t work in FF14. 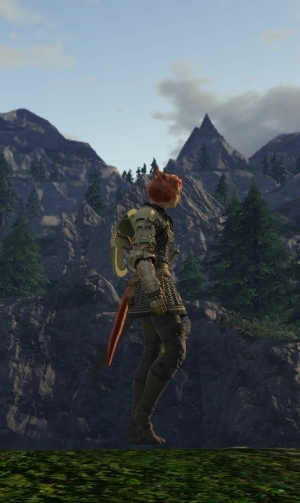 I recently came back to FF14 and found my old cross class job skills are gone, I had worked on Marauder/Warrior and Gladiator/Paladin to get the cross-class tank skill for my dark knight focus as I was the tank for my little group but that’s all gone now and probably a good thing really. The new system works but let’s face it some of the abilities are vastly better than others; as a machinist I always have the MP recovery ability up in a group as its huge for boss fights and bad pulls, giving the healers and other DPS mana they need so it’s a no-brainer choice compared to one like foot graze that while not useless, pales in comparison. I love the slow build of abilities in FF14 and other games as it lets me add a little complexity while building on an established foundation, much like I prefer my 4x games to start with a single planet and a scout ship and expand into a huge empire; the slow build means I can encompass new things gradually and learn things as I go instead of suddenly having a ton of options and unsure of how to play them. I rarely level boost character for this exact reason. They do need something to differentiate different people playing the same class. Right now your choices are very limited if you want to do well at the harder stuff and that creates a very cookie cutter effect.